Someone decided to rip of Frank Miller in exactly one panel today. Actually the art on looks pretty good, bravo to the colorist for the gradient shades on Chester’s bald head. And you can actually tell that it is supposed to be a Hulk poster in the background. Much better than the weeklies. If you look at Saturday we have a brown Green Arrow, and a nearly black Spider Man. I know that there is a black Spider Man now, but I don’t think he’s gone for a suit the same shade as his skin. In one entire week of strips, we’ve learned exactly HALF of why Chester is here. I’m guessing that at the end of next week we will finally learn why he wants to contact Mopey Pete. Chester wants to contact Mopey Pete? Really? That’s the saddest thing in today’s paper, including the Sears circular. A whole week wasted on a build up to Mopey Pete. Well, isn’t that special? “I wish to have a liaison with this Pete. Really, really looking forward to next week’s flashback imaginary story about what it was like when Secret Masters of Fandom tried to get messages passed to comic-book writers back in the days of Batom Comics. John: Chester Hagglemore? What brings a big shot like you here? Chester: I want to float a deal past your pal Pete but I don’t want people on-line to know it. Pete: My ears are burning. I assume he wants Pete to autograph that Spongeman artwork he got from Holly. Something extraordinarily dull like that. That’s one of the few real upgrades that Burchett contributes around here: the occasional stylishly lit panel (Batuik used to favor flat, 2-D silhouettes). Burchiuk slipped another one in last Sunday of Funky slouching towards the bathroom. Also on view today is RB’s fondness for weird, upward-looking angles, and ceiling tiles, which are to Burchett as bricks are to TB. Chester’s light gray suit in the meantime has turned white. Picking on the artwork is about the only enjoyment I get from this strip anymore. Whoa, hold your horses there. Do really expect TB to look favorably on a service that’s only been around for 225 years? By the way, is that Mister T in the 5th panel?? Wait a moment. Chester wants to contact Pete, but doesn’t want anyone to know about it…so why is he asking John? Doesn’t DeadHead John have a habit of blurting things out (like the plot of the SJ movie, or his salary requirements for working on same)? Maybe, since there has been a hypothetical 10 year time jump, all these characters are living in a dystopian future where what we now know as “The Internet” has evolved into a monstrous AI that is ruling the world and has its tendrils in all forms of communications. Thus, the only way for Chester to contact Pete Roquefort without being discovered by The Internet is to make a personal appearance at Komix Korner, confuse the listening devices with days of nonsensical banter, and then make his wishes known. DSH will provide Lat/Long coordinates of Pete’s studio where he can send a carrier pidgeon to deliver his coded message. Or, more likely, TB just doesn’t get how electronic communications works. Wanna make an already-plodding arc even less interesting? Say hello to Pete & Boy Lisa. Thanks to Batiuk’s uniquely-paced storytelling we still don’t know what the premise is, only that it somehow involved (yawn) comic books. Swell. Batiuk, I’m throwing down the gauntlet — I defy you to create something worse than the Flash Museum… If you do, I will buy your latest book. 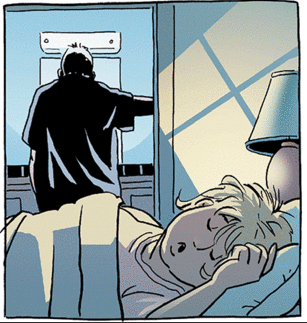 Crankshaft today is about how anything a writer uses for their writing they can write off on their taxes. I have a suspicion that the “Flash Museum” arc is the result of Batiuk blowing a lot of money on Flash crap and then claiming it was research for his strip and writing it off. 4. God forbid Baldy McComicsgeek just fly out to L.A. and set up an appointment at the studio since he clearly has the clout, right? ?